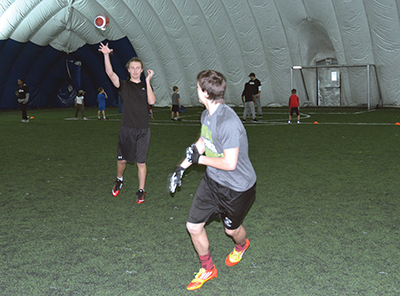 The Orangeville Outlaws have started their off-season training in the dome at the Athlete Institute as athletes shake off the winter rust in preparation for the 2017 gridiron season. Initially the training focuses more on fitness and getting back in shape rather than football skills. The camp is separated into division. Younger players in the Tyke, Atom, and Peewee divisions start out with their own workouts followed by the older, more experienced players who go through their own workout. “They’ve developed the skills training for the younger players based on foot and legwork and for the older boys will do more with stamina and endurance,” Davis said. It’s still pre-season so teams for this year are still being put together but the Club is hoping to field a team in each division. Bantam, Junior Varsity, and Varsity teams will definitely be on the field this season. Sign-ups are looking good so far for the three younger divisions. The off-season training runs for three Saturday’s with pre-season practicing getting underway in March. The Outlaws usually have around 150 players sign up each year. New this year, the Outlaws have joined with a new provincial league that replaces the Ontario Minor Football League of previous years and has a two tier system of teams. The new season gets underway in May with the first games scheduled to start on the May long weekend. There is still plenty of time for players to sign up for the season. “We’re going to be here every Saturday so they can come out here. There’s still time to sign up. There’s still three weeks before we start practicing so if anyone still wants to sign on were are more than willing to take them on.,” Davis said. Anyone wanting to found out more about the Club can visit the Outlaws website at www.orangevilleoutlaws.com.